Hello my friends! 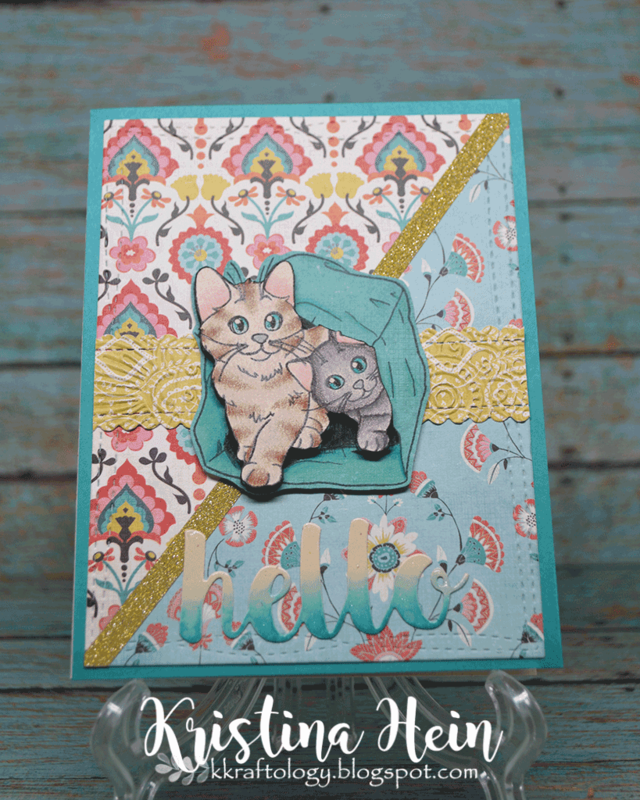 I've got another card to share with you that I made for the Love Your Pet blog hop. 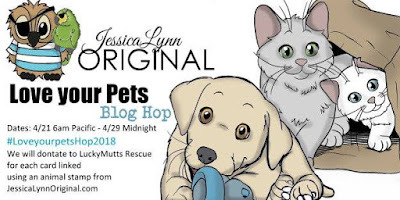 I wanted to remind you still have until midnight on April 29th to link up a card for the blog hop. You can link your card up and find full details on the JessicaLynnOriginal blog HERE. There are prizes to be won AND donations are being made to Lucky Mutts Rescue for each card or project entered! Now, for my card today. I used the only other image I hadn't used yet in Celine's Kittens. The two adorable kitties playing in the paper bag! Since I have already made one card with Copic markers and one card with distress inks, I needed to pick a different medium. Some times I have a hard time picking a medium. So many awesome ones to choose from! 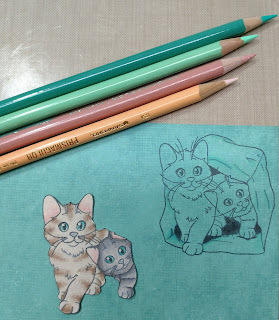 Colored pencils won out today. I first stamped the image on a piece of teal patterned paper from the Basic Grey Spice Market pad. Then I stamped the image on a piece of Stampin Up Naturals Ivory cardstock. I went ahead and picked the rest of the patterned papers I wanted to use so I knew what colored pencils to pull out. All the colors I used are from Prismacolor. Here's what the pieces looked like after I finished up the coloring. The two larger pieces of patterned paper I cut down to 4 1/2" x 5 3/4". I stacked them together and cut them on the diagonal. I wanted to make sure the pieces would fit together perfectly. After I cut them, I glued them onto a piece of scrap copy paper. I needed them to stay put while I used the MFT Stamps Wonky Stitched rectangle die to cut out the papers. I didn't have a piece of glitter cardstock quite large enough to span the diagonal across the card. I remembered that I had some gold glitter tape from The Ton Stamps. It was just the thing! I added it to the paper and trimmed off the edges. I glued the patterned panel onto a teal piece of cardstock and then onto a white, A2 sized card base. I pulled out one more piece of patterned cardstock from the Basic Grey paper pad. I cut it into a strip, used a mini scalloped and stitched edge die to add details to the top and bottom. I wanted even more detail so I put the strip into a floral embossing folder and ran it through my Cuttlebug. Attached it to the card panel and cut off the edges. Back to the cat images. I fussy cut the cats out of the ivory cardstock and went around all of the edges with a black marker. Then I took some thin foam tape and adhered it to the back of the cat piece. I carefully lined it up with the cats on the bag and attached it. I did decide to use a fine tip black marker to go over the kitty whiskers. Colored pencils can obscure some of the stamp lines so you may have to go back over some of them. Now I was down to the home stretch, a sentiment. 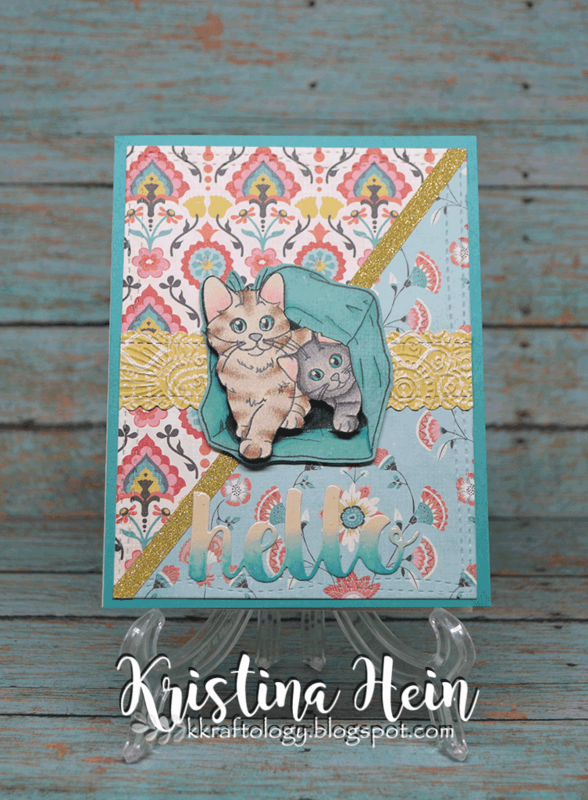 I used a Hello die from MFT Stamps and cut it from the same natural ivory cardstock I used for the kitties. I found that the Peacock Feathers distress ink matched really well with my card. I sponged it on to the bottom portion of the sentiment and blended it for an ombre effect. I sprinkled a little bit of water on it and dabbed off with a paper towel. Once it was totally dry I added it to the card. One final step. I went over the sentiment with Shimmer Pico Embellisher to give it a little glitter and shine. There you have it! Another beauty! 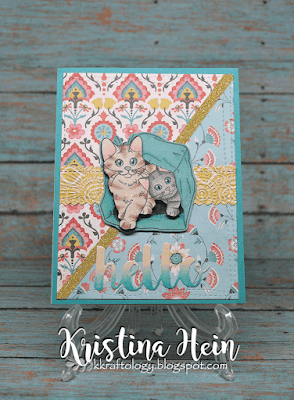 Love the papers and great paper piecing on the image... also love the multicolored "hello" die cut... love it!